Easy to apply thanks to its high fluidity and flatness. Substrates must be resistant, stable, sound and clean, free of dust, demoulding agents, organic products, etc. 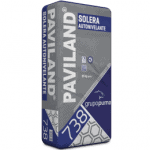 Before applying PAVILAND SOLERA SELF-LEVELLING compound, repair any cracks and/or fissures on the substrate with products from our Niveland, Paviland or Morcem Rest ranges, according to the nature of the substrate and repair to be made. For bonded floors (thicknesses lower than 50 mm) to concrete resistant substrates, first apply PAVILAND PRYMER R. For other substrates such as marble, ceramic etc, please consult our technical department. Define and mark the maximum dimension of the floor. Mix the product with water (4.1-4.6 L per 25 kg bag) mechanically, with a low speed mechanical mixer (approx. 500 rpm) until a uniform mixture without lumps has been obtained. The exact quantity of water is very important to avoid product separation, high shrinkage and lowering of strengths. Leave the mixture to rest for 2 minutes. For large surfaces it is recommendable to pump the mixture with double helicoidal pump at 20 to 40 litres/minute. This operation permits the maximisation of using times. Spread manually with a metal levelling trowel once the primer has hardened. Next, pass a nylon spiked roller. Respect structural joints and make perimetral and partitioning joints. Paviland Solera Self-levelling compound must be protected by ceramic, wood, linoleum, resins, etc. Do not apply under 5ºC nor above 30ºC. Use gloves or protective goggles when applying product. Do not add sand, cement or any other product that modifies the original formula. For floors larger than 20 m or longer than 10 lineal metre it is advisable to make partitioning joints, delimiting panels with 6 mm joints that can be sealed with PUMALASTIC MS or PU.